Though I have not lacked motivation this May, I have been engaged in a frustrating battle with the flu. After the Snow Dome adventure, I was completely useless the next day, and decided to rest until at least the fever and headache were gone. 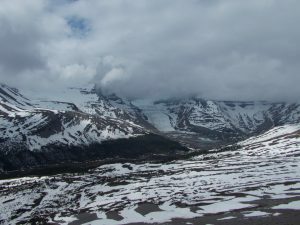 By the time I finally recovered enough to ski up onto the Columbia Icefield again, the weather began to turn, so I only made it about halfway to my goal. Still, it was a fun ski, especially the part where I briefly hit 38 MPH descending the Athabasca Glacier headwall. That may be slow by inbounds standards, but it’s not bad for chunky backcountry snow. 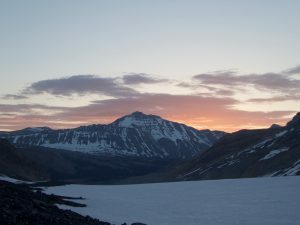 While waiting for the clouds to pass, I decided to tag the very British Nigel Peak, Wilcox’s southern neighbor across the road from the Icefield. It had melted out dramatically in the days since skiing Snow Dome, allowing me to tackle its west face with lightweight gear. Where snow remained, though, it was almost always awful, isothermal slop in which one would posthole to the bottom, knee- or even crotch-deep. It’s a short climb, so I took my time getting started. The trail to the red chairs was mostly snow-free, though still muddy, especially in the trees. I followed it until a couple hundred yards past the chairs, then took off cross-country toward Nigel’s base. Its southwest ridge (which turns northwest) has a number of chutes on its southwest side, one of which is apparently the standard route. I did my best to avoid the lingering snow among the meadows and brush on the way over, because it was all wretched and bottomless. My efforts to minimize postholing left me near the base of the left of the two most likely chutes, which proved fortunate. 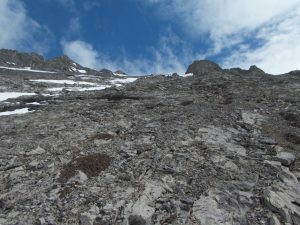 The right-hand chute is all scree, perfect for descent but terrible for climbing. The left one, however, is about half exposed limestone, which is solid and sticky even when wet, making for much more efficient uphill progress. Once on the ridge, I traversed past the right-hand chute, then continued along the crest, where I only sunk in shoe-deep as long as I stayed away from exposed rocks. Transitioning between rock and snow usually involved one or two crotch-deep postholes. Thanks to the snow, I stayed closer to the ridge than is probably normal, climbing a couple of fourth class steps along the way. A couple hundred feet below the summit, I contoured left into a gully, finding firm-ish snow near the cliffs, and bare talus elsewhere. 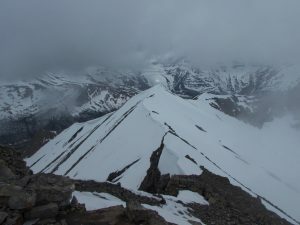 After a final short, steep climb, I emerged on the summit ridge, and was soon at the cairn. There was of course nothing to see but the register, where I noticed both prolific Canadian guidebook author David P. Jones, and a hard-core seven-year-old kid with his dad.